J. Dwight Pentecost is distinguished professor emeritus of Bible exposition of Dallas Theological Seminary. He is the author of numerous books including Prophecy for Today, Things to Come, and Things Which Become Sound Doctrine. - Publisher This is an analysis of eschatology, Biblical promises and prophecies of the Great Tribulation, the second coming and the millennium. 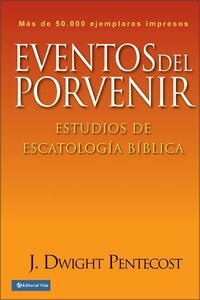 About "Eventos Del Porvenir (Things To Come)"
This is an analysis of eschatology, Biblical promises and prophecies of the Great Tribulation, the second coming and the millennium. J. Dwight Pentecost is distinguished professor of Bible exposition, emeritus, at Dallas Theological Seminary where he has served since 1955. He holds a B.A. from Hampden-Sydney College, and both a Th.M. and Th.D. from Dallas Theological Seminary. His many works include The Joy of Living, Design for Discipleship, The Divine Comforter, and Thy Kingdom Come.